Are you a shopaholic? Go on admit it. You just can't resist all those lovely shiny things, right? 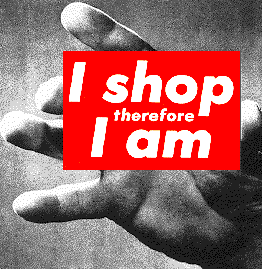 Well, if you are not, you will perhaps be more aware that consumerism is rife in today’s world. It lurks everywhere, around every corner, ready to ambush you and to part you and your cash. Travelling takes you out of your routine however and I think strengthens your resistance to the pressure of consumerism. Most people are constantly exposed to consumerism in all its glory, especially in the Western world. Advertising is consumerism’s weapon of choice and we are all exposed to it while commuting, shopping, reading the paper, watching TV or listening to the radio. You really have to live under a rock to truly avoid it. We are tempted endlessly, by things that we ought to spend our money on in order to make our lives more fulfilling, more fun and supposedly easier. Living in London I really felt the pressure of consumerism. It is easy to subconsciously compare ourselves to others and to worry that we will be judged if we do not have the latest gadget or fashionable clothes. We become materialistic and greedy for more. I always thought I was quite good at resisting it. I have always been quite self-disciplined about my spending and kept away from shops in an effort to avoid temptation, only shopping for things as I needed them, but when I left London I still found I had far more things that I ever needed. Fail. You could feel the absence of your belongings, but I am embracing this challenge. I actually find life is simpler with fewer things (except dressing for work if you have a career change). I only have so many options when deciding what to wear and I know where to find most of my things (most of the time!) Of course, a couple of things are important to have but you’d be amazed at the number of things you don’t miss. Fewer possessions also means fewer things to maintain, repair and store, saving time for other activities. Focusing spending (time as well as money) on activities and experiences, rather than material possessions leaves us feeling more content. People don’t lie on their deathbeds regretting not having had more clothes after all do they? To me, this is a clear case of less is more. This doesn’t mean that I live out of a bag. When I spend extended periods of time in one place of course I buy a few things. I recently bought a second hand bike and helmet, some strawberry plants and am thinking of buying a food-processor (rock n roll – eh?) These are things I have identified as things that would enhance my life here. I enjoy cycling, growing strawberries (four green ones so far) and cooking. These are not articles I want as a result of being exposed to advertising or peer pressure. I don’t hold any emotional attachment to these things. I am enjoying them now and next time I move I will sell them or give them away. Think how you feel when you are on holiday. You are somewhere away from your normal surroundings. You are a safe distance from work, assuming you can leave the emails alone. You are also estranged from the peer pressure to keep up with others. Nobody knows you on holiday and the people you meet judge you for who you are and not your possessions. Travelling, for me, has made life more like that. Do I mean lounging on a beach reading paperbacks and drinking cocktails, well no actually. I do think that having and wanting less makes focusing on rewarding activities and ultimately contentment a more achievable goal though. 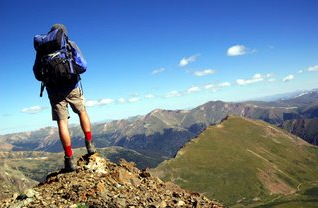 Do you feel that travelling has altered your attitude to consumerism?